Not everyone has bucket loads of cash to spend on looking their best. 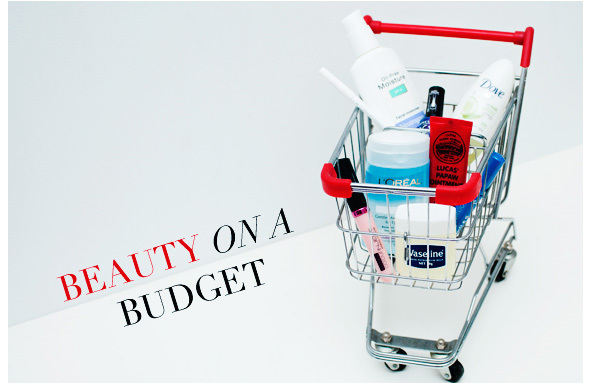 Some things you shouldn’t skimp on, like foundation but most products you can buy on a budget. Here are some of my favourite cheap buys, which you can pick up from most supermarkets and Priceline. Neutrogena Oil-Moisture SPF15: One of my favourite cheap skincare brands, I use this moisturiser every day. It rocks. Rimmel 60 Seconds Nail Polish: The best of the cheap nailpolishes, Rimmel polishes have fantastically shaped, slightly curved brushes for a perfect application. Pick up Blue My Mind, an awesome midnight blue with a dual reflect. Lucas’ Papaw Ointment: An Aussie classic and a makeup artist kit essential, this balm can be used on chapped lips or dry skin, on rough elbows or to add shine to the cheekbone. A must have. Rimmel Kohl Eyeliner: Super soft kohl eyeliners, perfect for creating a smudgy eye or lining the inside of your eye. Some people don’t like white on the inner rim, but I find the Rimmel one isn’t overpowering. L’Oreal Gentle Makeup Remover for Eyes: Make sure to shake up this bottle before using, squirt onto a cotton pad and hold over your eyes for a few seconds to break down your eye makeup before wiping it away. Australis Colour Inject Mineral Lip Gloss: Some gorgeous colours in this range and they all smell so so delicious. Rimmel Waterproof Mascara: This mascara’s not the world’s greatest but for under $13, it’s pretty damn good and it’s DOES not smudge. We also picked up some Vaseline and Dove roll on deoderant in Go Fresh as these are pretty essential beauty buys too. What are you favourite cheap products? Megan what is your favourite low-end bronzer for pale skin? I prefer M.A.C but I’m on a budget at the moment. Can’t go wrong with Lucas’ pawpaw lip balm. I also swear by Sorbelene cream as an ultra gentle make-up remover. JM - Thanks for the info! Alicia - I love the giant bronzer from Australis, it has a green tint so it comes out brown rather than orange. Also, the Natio giant bronzer is very good.